Cooking, baking and roasting on/in a box stove video is HERE The heating and cooking stove contained a fire box for the wood on the bottom with the door in the front. The upper section was the oven with a door on each side. The hole on top in the front was for a stove pipe for the smoke. The rear top boiling hole is for a pot or pan, and the bottom plate has an oval "hearth". As cleverly simple as these stoves were, their construction was a fascinating combination of moulds of sand, a water wheel bellows and fiery molten iron. Hopewell Furnace, founded in 1771, was located west of Philadelphia within a large wooded area (to make charcoal) and iron ore mines and made cast iron stoves, canons and other iron items. The panel box stove in the first picture is a "Hopewell No. 8," also labeled "Hopewell Furnace" and "Clement Brooke" - the manager of the furnace from 1816-1831. The large white building, the cast house, contained the furnace in the rear, and area for the sand molds. The bell in the bell tower rang to announce to the sand moulders that the molten iron was ready to extract and fill the molds. Behind and above the cast house, is the bridge house where workers moved charcoal from the charcoal house, and combined with iron ore and limestone, were poured into the top of the furnace. The marvelous bellows wheel was run by water which moved the workings inside the two "blowing tubs" moving the air into the receiving box in the middle. The air is forced from the box into an air duct which then enters the furnace. 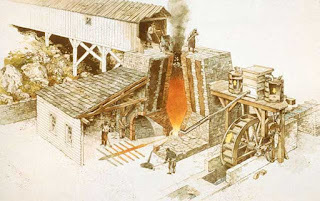 The air duct with the rushing air crosses from the wheel over the working area, and down the outside of the furnace wall, and into the furnace to super heat the fire. Behind the modern small metal furnace (for demos) is the dark hole on the back wall where the molten iron was removed from the huge furnace. Every twelve hours with temperatures reaching 3,000, the Founder would tap the furnace and the moulders would fill the moulds. The moulder prepared the sand moulds carefully from a wooden mold. 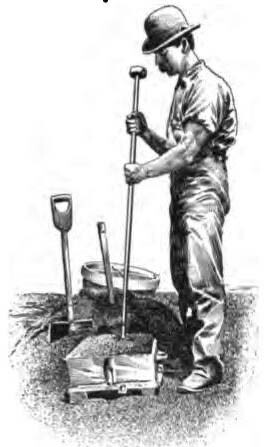 The impression, above, was made by sieving wet sand (round sieve on sand pile, below) over the wooden form, ramming the sand until firm, then removing the mold. A few more steps, and it is ready for the pour. The hot molten iron is poured into a hole in the sand mold. The finished piece (small front door in piece he is holding) is taken out of the sand and finished smooth. The sand can be reused to make a different mold.